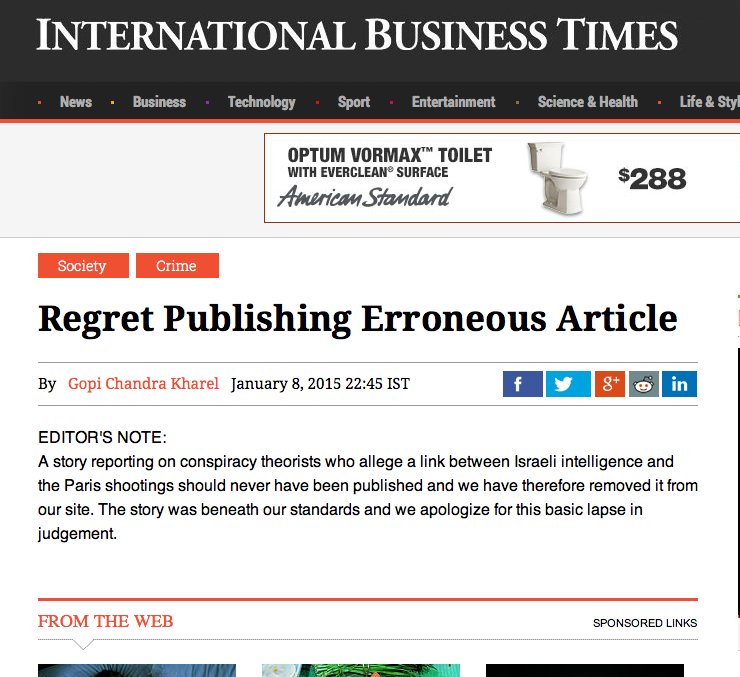 Incredibly ironic that, after a deadly attack against journalists (allegedly for freely expressing themselves), another journalist should be forced to apologize for expressing himself (or presumably lose his job at the International Business Times). I guess economic terrorism is okay. Even I was unceremoniously blocked by one of my Facebook friends for pointing out that there were many irregularities apparent in the attack that wreak of a false flag attempt to enflame anti-muslim sentiment. Before he blocked me, I was told it was “incredibly irresponsible” to blame zionists for this heinous attack. It didn’t matter to him that it had already been prematurely blamed on “radical Islam” by everyone in the mainstream media when even a congressman from the house intelligence committee admitted that they simply don’t know yet who did it. I will be “responsible” in my accusations as soon as the mainstream media is responsible in theirs. Muslims all over the world are already feeling the backlash of the mainstream media’s “responsible” reporting. It’s time to call a spade a spade. If freedom of speech is good for you. It’s good for me. If that Paris shooting took place at a TEA PARTY/OWS newspaper would there be such a HIGHLY ORGANIZED outpouring of protests complete with thousands of professionally printed signs with a “snappy slogan” within hours? Such massive “support”for Free Speech? Funny how the disgusting crude filth they printed is so honored. …what a group of cowards you all are…I wouldn’t read your rag if you paid me you bought off group of Israeli Whores…. …no wonder there are no comments….the Israeli Whores from this rag are monitoring and censoring their own comment section…afraid they are that they be seen as the fascist pigs they are…. I wonder, who are you directing your message to?